Do not use this company. First, they trick you into handing over your email address for a "20% off" coupon. Then, when you see an arrangement that says $31.99, it's actually a picture of the "deluxe" version, which is more $. You might decide at that point that it's worth the $35.99, so you start your order, which at first says $39.99, with the discount "applied." At that point, you call the company because your discount's not going through and they say, "No problem, I'll take your order for you," so you spend 15 minutes getting the order down. Then they want your CC info BEFORE they give you a total. You give it to them and then they say, "It's $62.99." You say, "WHAT?" And then they start adding up all the charges that the website isn't upfront about and, in fact, is dishonest about. There's $14.95 for delivery. And extra $6 for a handling charge. $2.99 for next day delivery... It's a racket. And by the time you say "NO" they've got your email address to spam (three on the first day alone) and your CC info. If you're wise, you'll get a new card. I went ahead and ordered local, where the price was actually the price and everything was up-front. This has to be the biggest rip-off flower company ever. 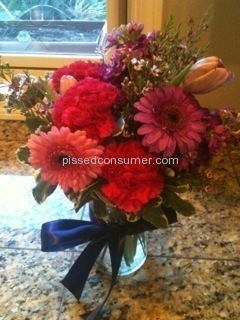 They charged me $90 for the crappiest flowers. 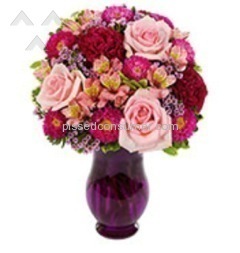 When I complained to them this what they told me: "Thank you for contacting From You Flowers. We have received your message expressing your dissatisfaction with the arrangement received. All items are subject to slight substitution according to local availability and season as stated in the product's delivery information on our website. This allows the florist to substitute with a similar container, flowers, color scheme or plant to ensure delivery is made in a timely manner. We sincerely apologize for your disappointment with the substitution made. Therefore, we are issuing you a $10 gift certificate via email to redeem at any time on a future purchase. You will receive this gift certificate within 1-3 business days. We have also informed the delivering florist of the complaint, and they asked that we extend their apologies to you as well." What a joke. The correct thing to do would have been to either issue a refund or resend good flowers. BEWARE. DO NOT BUY FROM THEM. Do not buy flowers from here. I purchased some last week for my friends birthday and they never made it to her. They only offered me a $15 credit to "make up for it". Also, it was nearly impossible to get someone on the phone to tell them what was wrong with my order. The girl that was trying to help me was new so I asked to speak with someone else and she put me on hold and told me her supervisor said they would only give me $15. That only covers shipping. And why would I buy more flowers from them when they already messed up? DO NOT BUY FLOWERS FROM HERE. Worst customer experience I've ever had - across all industries. Delivered flowers to a grieving family 5 days late and get the sympathy note wrong. Give me a credit (not to my debit card) which needed to be used within 7 days. Who has multiple flower sending moments in one week? It doesn't make sense! They don't understand their customers at all!! Supervisor calls and says I should call back to discuss a solution. On hold for 20 minutes. Most working folks don't have 20 mins to spend on hold. This company is infuriating and incompetent. Screw the credit - take my money and never talk to me again #CustomerServiceFail #WorstCustomerExperience. I had issues with my first order. I had paid to have my order expedited in under 4 hours, and it took 7-8 hours plus two phone calls to ensure it was done. They refunded me that piece of it, but still left me a bad taste in my mouth. I was *** enough to order again when I received emails stating my nearly $14 credit was set to expire. This "credit" was merely a discount for stuff they give you anyway. When you go through the checkout process with these people you end up paying nearly double with what you originally thought something would cost. Do not assume that you have a credit on account, but is just a discount that they'll likely apply to any order before they all all their surcharges. Highly recommend buying flowers and paying a darn Uber guy/girl to deliver them! At least they'll look you in the eye before driving off. Their solution to my problem was offering me a $10 gift card for a future service. I'm sure it would get offset by a $10 service fee knowing their practices. From You Flowers - This company called me 30 minutes before the Memorial Service to tell me they couldn't deliver my order! I was looking for a Sympathy basket to send to my friends memorial service - I wanted a plant that would continue to live after the service. I found a beautiful basket on fromyouflowers.com that had live plants, and fresh cut flowers. I thought it would be perfect! I placed my order and noticed in the delivery section that it 'guaranteed delivery by 1200 pm". I called the 1-800 number, and sat on hold for awhile. My friends service started at 1000 am, and I needed to make sure the basket would be there on time. 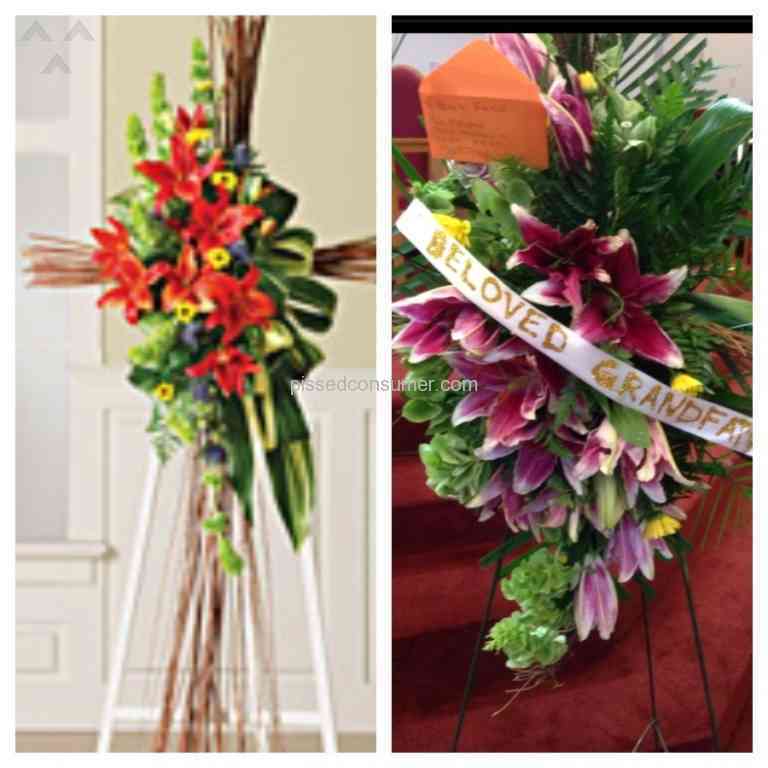 The agent that I spoke to assured me that the florist would make arrangements with the funeral home to have the basket there in time for the service. I went ahead an placed the order. On the day of the service, 30 minutes before the start of the service, I received a phone call from Fromyouflowers.com. They wanted to let me know that my order was not completed (for what reason, I do not know), and they would give me 20% off, and deliver it another day to a different address. 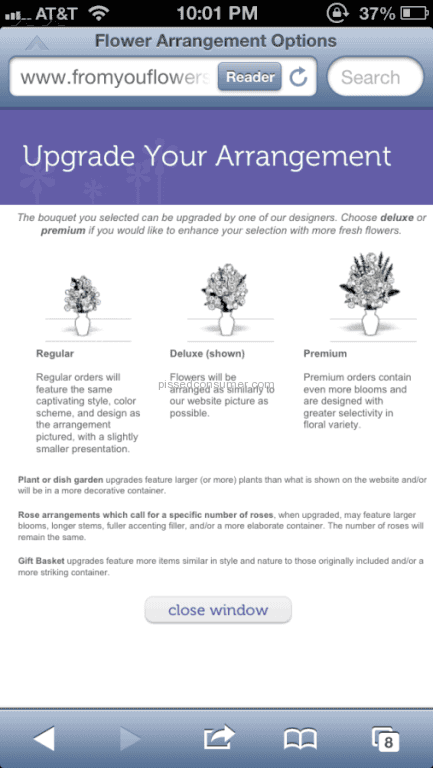 I cancelled my order, and will never order from here - and probably not any other online flower company - again. From You Flowers - NO CALL, NO FLOWERS, RUINED 71ST BDAY FOR MY GRANNY! So let me get this straight... Since you said your expedited service was for within 4 hrs, meaning you ordered last minute on the same day as it was. Plan ahead next time. From You Flowers - TWO Days Late & Not the Flowers I Paid $50 for. Wait how is that not the florists fault if they're the ones that didn't deliver it on time... sounds like you were just a difficult customer here.